The words coming out of this participant’s mouth are foul offensive to say the least. But yet all participants in the crisis negotiation seminar are laughing. In fact, lying there on the floor in front of everyone, even the student shouting these profanities could barely contain a big and welcoming smile. I had told the student to tell me off to the best of his ability. And I told him to do so repeatedly while we changed his posture, our seating arrangement, and other aspects of the situation. As it turned out, lying there on his back made it quite difficult to keep the fight going. In contrast it was much easier for him to act aggressive two minutes earlier when we were face to face and two inches apart. We ran this exercise in response to a participant asking the question: “How do you deal with emotional people?” When a person is in an emotional state, perhaps as a result of experiencing a crisis, he or she will have very little available attention for you or what you want. This typically makes it much harder for you to have the type of constructive dialogue that you probably prefer. Thus the key to dealing with an emotional person (or more accurately, a person who is in an emotional state) is to first influence that person to adopt a more rational frame of mind. 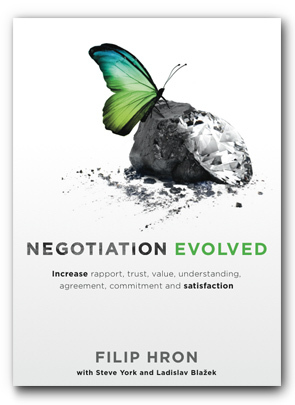 Many of the most powerful tools for achieving this are derived from crisis negotiation, and you will find several of these in our book, Negotiation Evolved.